The Humpty Dumpty Institute in partnership with the Iraqi Independent Film Centre (IIFC) conducted a workshop for 13 young Iraqi filmmakers in Baghdad from May 1-10. 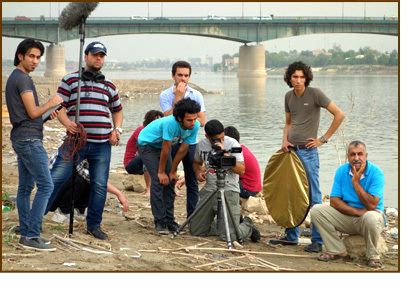 The U.S. Embassy in Baghdad funded the workshop with additional support coming from Iraq Al-Rafdin and Human Film UK/NL. The training was part of the International Film Exchange, a program of the Humpty Dumpty Institute that trains filmmakers with special promise from around the world and helps them use the power of film and television to highlight important social issues. In addition, the IFE raises awareness in the U.S. film industry about the struggles of promising filmmakers abroad when attempting to document those issues. 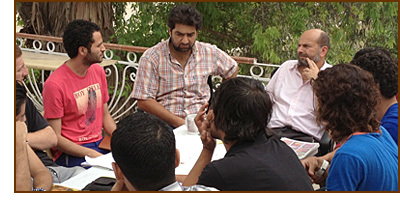 The theme of the Baghdad workshop was “Telling the Story”. It was designed to build upon a series of training activities conducted by IIFC beginning in January under the leadership of Iraqi’s most important filmmaker, Mohamed Al-Daradji (“Son of Babylon”). The workshop's instructor, Bill Megalos, is a California-based filmmaker with more than 30 years experience producing and directing feature films and documentaries. Seven of the workshop participants are slated to travel to Los Angeles in June to take part in an intensive ten-day program at the UCLA School of Theatre, Film and Television. Participants in the UCLA program will receive a stipend allowing them to produce a short film of their own upon returning to Iraq. As part of the learning experience during the workshop in Baghdad, participants worked as a team over a ten-day period to produce a four-minute short film entitled "Bazoune” (The Kitten). The subject of the film is a precocious little boy who can't stay out of trouble. It is loosely based on one of the many neighborhood children who hang out at the IIFC campus along the banks of the Tigris River in the old quarter of Baghdad. The IIFC screened “Bazoune” at the Babylon Festival of International Culture and Arts in Iraq on May 9, 2013. For more information about the International Film Exchange, please contact Joe Merante at 212-944-7111 or joe.merante@thehdi.org. The Humpty Dumpty Institute is a unique non-profit organization serving people in the developing world through the implementation of large-scale humanitarian projects and through our work with the United Nations. Since 2006, HDI has implemented significant development projects in Angola, Mozambique, Eritrea, Lebanon, Armenia, Laos, Vietnam, Sri Lanka and Pakistan. These projects are sponsored by individuals, foundations and governments. In addition, HDI fosters dialogue between the United Nations and a variety of constituencies in the United States including the U.S. Congress, universities, and the creative community; all designed to help the U.N. become an even more effective Institution. To learn more about HDI’s programs, please visit our website at www.thehdi.org.